Melanie took her first step on a yoga mat when she was about 9 years old. Her mom thought her and her friends at home and soon later she attended classes at a yoga school nearby. Yoga became and stayed a true companion - at least most of the time ;-). About at the same time she developed a passion for cooking delicious, healthy food. But as life goes, she experienced some other adventures, before she was able to make her two passions her work. To be able to combine her two amazing tools - yoga and nourishing food - She did her yoga teacher training with Stephen Thomas (Airyoga, Zurich) and specialised in kids yoga (Cosmic Kids). She is a member of the Yoga Alliance. The result is Yoga in a Bag, designed to help you become your own best version and master your life with ease and happiness! Yoga has been an important part of Carina’s life for 7 years. The experience of perceiving each moment more consciously through yoga while learning more about oneself and our environment still fascinates her today. Carina is a very creative and positive person who loves spending time in nature, to paint, to cook or to philosophise about life. She is committed to reduce waste in our environment, and works daily on filling her life with fewer things but with more inspiring people and experiences. Her helpfulness and empathy are felt not only in conversation with her, but also during her yoga lessons. Finding balance and using one’s own resources responsibly is very important to her. 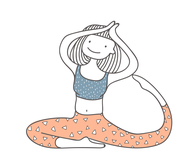 Her lessons are characterized by demanding flows, intense poses, but also enough regenerating asanas. This always with the aim to create more awareness for body, breath and spirit. 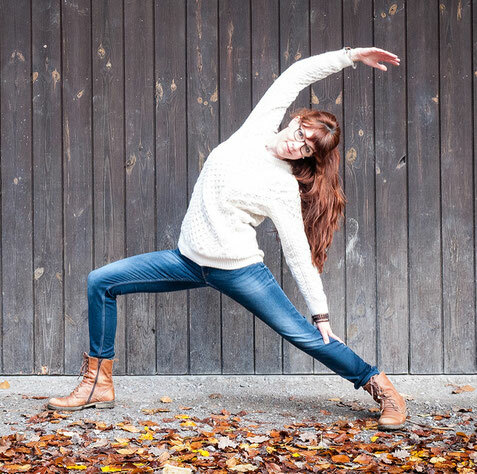 Carina is a certified Hatha Yoga teacher and studied with Poonam Stecher Sharma, Sanjeev Bhanot and Monoj Bhanot (Sanapurna Zurich –Yogalife) and continuous her studies within their CEP (continuous education programme). Right now Carina is in a Yin Yoga training with Josh Summers, interweaving yoga and the ancient wisdom of chinese medicine. Carina is registered as a RYT 200 with Yoga Alliance. About Six years ago, Tanja came into contact with yoga for the first time. Today, she is frequently inspired and fascinated by yoga. Tanja loves when her body is moving through various asanas, connecting the movement with her breath and allowing her mind to rest. The noticeable positive effect that yoga has on everyday life impresses her again and again. During Tanja’s studies as a primary teacher, the desire to become a yoga teacher started to emerge. Soon, a small yoga group evolved, so Tanja began to lead her fellow students through a weekly short yogaflow. Satisfied faces after the weekly yogaflow strengthened Tanja’s desire to deal with yoga more intensively some day. In 2017 she completed a 200h training at Airyoga Zurich under the guidance of Stephan Thomas. It is a privilege for Tanja to pass on her excitement and fascination for yoga and to help participants to find more awareness for their body, breath and spirit through powerful yoga practice. It was 2005 and Katja was studying Media Design in Austria, when she went to her first Yoga class. Although she was intrigued, she did not practice on a regular basis until years later. However she then soon noticed, that Yoga is more than just moving into poses, and that the practice gives her a lot. Especially after the birth of Katjas first daughter she realised how greatly Yoga influenced her physical, mental and psychological well being. The wish to go deeper and learn more about Yoga led to the decision to do a 200h Hatha Yoga Teacher Training at Airyoga Zurich with Stephen Thomas. She is grateful that she was able to study not only with Stephen, but also with other international teachers like Doug Keller, Claire Dalloz and Anya Porter. In 2018, Katja will attend a pre- and postnatal Yoga Teacher Training with Sue Elkind, so she an accompany women during a very special time in their lives. Katja is excited to share her fascination and love for yoga. Apart from yoga, Katja loves her husband, her daughters, photography, books, sewing, baking (she makes killer chocolate chip cookies), music, summer, thunderstorms, crashing waves, walking barefoot, cats, naps and laughing. Katja teaches Hatha Yoga, Yoga Nidra and prenatal Yoga. She teaches in English and German. At first Elena completed her Teacher Training without any intention to actually teach yoga. However, during her teacher training she realized how much fun it is to pass on what she has learned and to create an individual teaching style. Her classes are powerful and soft at the same time. Breath awareness and correct alignment are important for Elena. Besides physical challenge and relaxation also meditation and modern yoga philosophy are part of her teaching. She meets her students on the mat, where they actually are in life and takes them to an inner journey to themselves. After her 200h vinyasa- and yin yoga teacher training in Zurich several advanced educations like the advanced yoga teacher training “therapeutic art of adjustment” (Rae Indigo) and the yin yoga teacher training (Markus Henning Giess) followed. At PilateSwiss (Zurich) she absolved the Pilates Mat Basic course. The classes of Elena will be accompanied by soft and modern music. Elena teaches in German or English.